“The PPA unnecessarily saddles ratepayers with extraordinary above-market costs — $1.25 billion. We could probably get almost 500 megawatts of renewable energy for the price we’re paying for this 250 megawatts.”—CPUC Commissioner Mike Florio. That was the essence of Commissioner Florio’s pique in voting no on the approval of a purchase power agreement between PG&E and a solar power producer. We are seeing more of this show up as the cumulative cost of meeting California’s 33% renewable Portfolio Standard by 2020 piles up. As far back as 2009 the CPUC staff said that by 2020 consumers’ rates statewide would go up by 28 percent overall with about one-third of that price hike caused by the renewable portfolio standards so it was good for Commissioner Florio to raise questions. The CPUC ultimately voted 4-1 to approve PG&E’s 25-year contract with the solar thermal project with Commissioner Mike Florio voting against it. But there is another issue the Commissioner may be worried about. Over the past year the California Energy Commission, the state’s power siting authority, approved nine utility-scale solar thermal power plants in California’s Mojave and Colorado deserts. These utility-scale solar thermal projects are a different technology than the smaller, cheaper photovoltaic solar panels you see on rooftops. The market has an oversupply of solar PV panels and panel prices have dropped nearly 50% over the last year. But the utilities and the CPUC keep signing long term contracts in order to assure that the 33% RPS targets will be met. 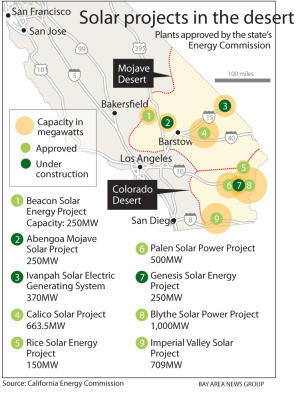 That lure of cheap PV prices has resulted in abrupt changes in five of the nine solar thermal projects from utility-scale solar thermal to cheaper solar PV technologies at the Beacon, Blythe, Calico, Imperial Valley and Palen projects. The same thing is happening in Arizona, Nevada and other states. The benefit for the developers is that the solar PV projects are MUCH EASIER to get approved so they are faster. The problem is the pricing on the long term contracts ends up in many cases being above market since the prices for PV panels are falling rapidly. Swapping out the newest solar thermal technology for the cheaper commoditized solar PV technology saves the developer money on the equipment but the remote location of the plants far from load centers requires costly transmission and other infrastructure not typically associated with rooftop projects. That is why Commission Florio said in voting against the contract that it would be better for ratepayer if the commission paid the develop the $7o million spent on the project to date and cancelled it instead of approving a long term contract that totals $125 billion above market prices. This entry was posted in Electric Power and tagged California, California Energy Commission, California Public Utilities Commission, Imperial Valley, Mike Florio, Photovoltaic array, solar energy, Solar thermal energy. Bookmark the permalink.